Your child has progressed past phonics, past developing reading fluency, and he’s even pretty good at comprehending anything and everything…what’s next for kids in the middle grades who like to read for enjoyment, but are not quite ready to delve deeply into the Greek tragedies or Shakespeare’s myriad allusions? Readers in Residence Volume 1 (Sleuth) from Apologia Educational Ministries might be just the thing. I recently had the opportunity to try out and review this brand new program with my 5th grader. 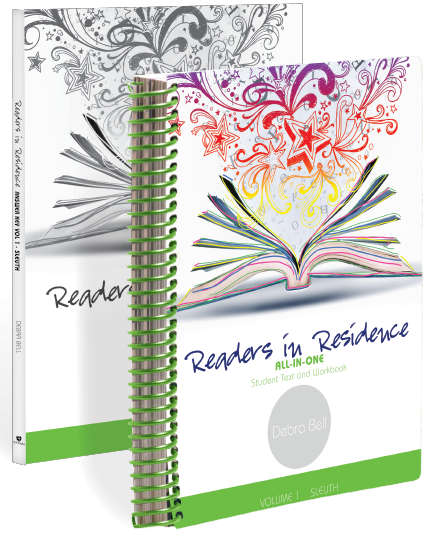 Readers in Residence Volume 1 (Sleuth) is a year-long course in literature, reading comprehension, and vocabulary for grades 4 –6 (or so). Apologia recommends pairing it with their Writers in Residence series for a full language arts program, but it could easily be used with other resources for grammar, writing, and spelling. The format of Readers in Residence is a little different from what I’m used to. The main book is a massive, full-color, 550+ page, spiral-bound, all-in-one text and workbook that the student writes in. It is written to the student, but has various points at which the student is instructed to discuss or share something with their teacher or instructor. By contrast, the answer key is a slim volume that contains possible answers to questions in the book. I found the answer key to be a great help to have while discussing my son’s work with him. Unlike many programs that are written to the student, Readers in Residence is not divided neatly up into daily, or even weekly, lessons. The author of this study, Debra Bell, has taken a lot of care to develop a very organic approach to reading literature and as such, Readers in Residence has a certain flow that would make it difficult to divide it up neatly into daily lessons. Just as a novel often grows out of itself, so too does the study of that novel grow out of itself. While it does have an overall rhythm to it that repeats itself, it doesn’t have a daily routine, if that makes sense. The book is divided into units which are divided into modules, which are further divided into sections. The lengths of units, modules, and sections all vary, so at first glance it seems a bit overwhelming. To help you to figure out how to pace the program, there is a suggested schedule included at the beginning of the book. We found that sometimes the pace was a little bit too slow or quick at times, depending upon how challenging my son found particular assignments, but it’s very easy to change the schedule to fit your needs. There is much more here than reading a chapter of a book and then discussing it. Before child even opens the first novel, he’ll learn how to look for clues by examining the cover and exploring genre. Once he opens the novel, he’ll learn about characterization and about how an author develops characters over time and tells you things about them by showing you how they behave rather than by telling you directly. He’ll practice making inferences based upon textual evidence and personal experience. He’ll learn new words by first thinking about them in context and then looking them up. He’ll explore themes. He’ll track how characters grow over time and rise to challenges. He’ll even do some creative projects. And more, much more. Readers in Residence is unlike any other reading program I’ve seen or used for this age group. Most often literature programs for the upper elementary to middle school grades focus largely on comprehension. While RiR does include comprehension questions, even those questions are often not straight factual questions, but require the student to refer back to the text and make inferences about things that are not spelled out there. It requires some real brainwork, and that’s a good thing. I think my son is enjoying it, though he sometimes gets bogged down in the “feelings” questions and the questions about character development. It’s hard for 11-year-old boys to think about things like why a grown woman would want to save the roses her possible future husband gave her when a storm is coming and other things may seem more important. On the one hand, it’s good to point out that there’s meaning below the surface, but on the other, sometimes the meaning will be a bit beyond some kids this age. I don’t push the meaning when that happens. We all have remember things we didn’t quite get when we were kids that we understand completely now. I know he’ll get it in time. At first, I thought my 5th grader would be doing the work more independently, but we’ve found it more fruitful to go through the lessons together. This is in part because of the nature of some of the work---we do some of the questions orally so we can discuss them, but also due to the format of the program. My son does most of his other work independently, but he gets overwhelmed by the size of this book and the fact that there isn’t a daily “do this, do that” vibe to it. He also finds it difficult to write in the book and to use the “dictionary” in the back for the vocabulary lessons. I would love it if, instead of being one large spiral book, Readers in Residence was offered as 3-hole drilled pages that could be added to a binder one unit or module at time. This would make it easier for the student to see exactly what he is supposed to do without getting overwhelmed by the overall scope of the thing. I think it would be hard to divide it into a separate text and workbook, because so many parts of it are intertwined together (you would be constantly referring back and forth), so I can see why they put it into one big book. As an English major, I love that Readers in Residence Volume 1 (Sleuth) gets kids thinking more circumspectly about what they are reading. I love that it isn’t the same old tired comprehension questions. I give it two thumbs up for solid content in an attractive package. For additional information and a substantial sample to download – here is a landing page , and the faq for Readers in Residence.